On October 19th, HCMUTE awarded Honorary Doctorate Degree for Mrs. Smita Pant for her outstanding contribution and assistance in the last 6 years. 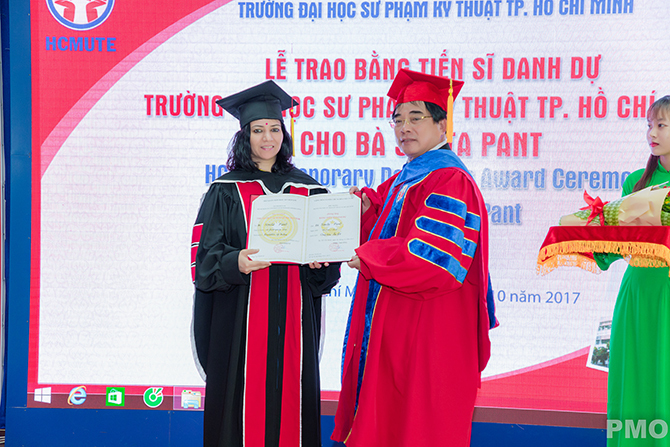 Honorary Doctorate Degree for Mrs. Smita Pant. At the ceremony, Assoc. Prof. Dr. Do Van Dzung expressed his sincere gratitude to the Consultate General of India, especially to Mrs. Smita Pant - Consul General of India in HCMC. Throughout the last 6 years, there have been 42 lecturers in HCMUTE who received the scholarships to undertake the exchange program in India. Besides, both sides have coordinated to organise the annual international seminars such as ITEC or Green Technology. Mrs. Smita Pant, taking the role as a Governmental Foreign Affair Officer, has always actively connected HCMUTE with the agencies and organisations in India. 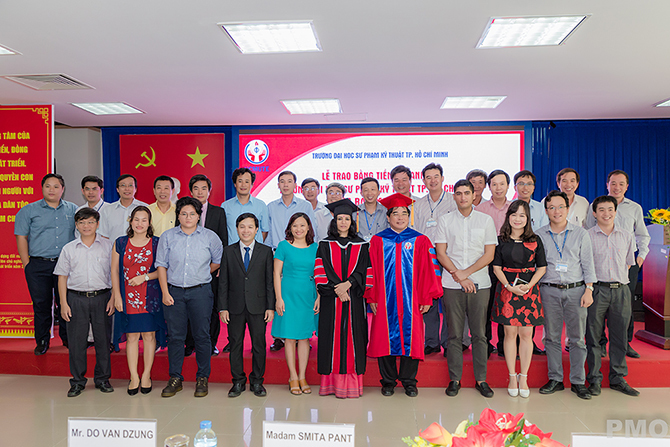 Mrs. Smita shared that she was extremely emotional to be one of the three Honorary Doctorates of HCMUTE. 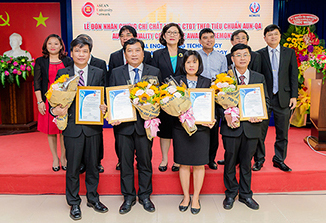 In addition, Mrs. Smita Pant has usually promoted the exchange cultures activities between Vietnam and India. HCMUTE has been updated and informed all the information of the cultural seminars such as yoga workshop, meditation forum, to name just a few, by her. 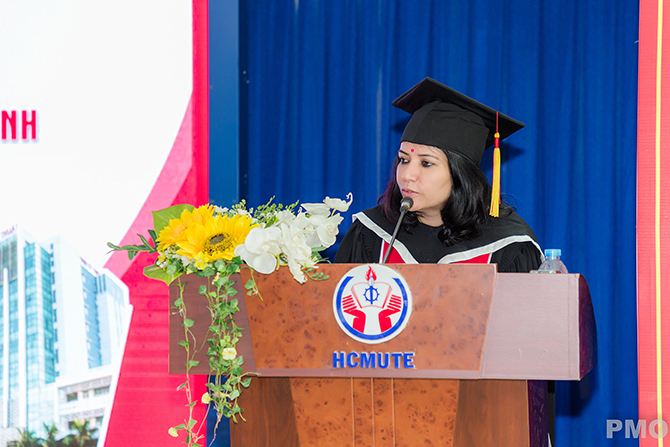 Mrs. Smita Pant shared: “I am extremely emotional to be one of the three Honorary Doctorates of HCMUTE. At the moment, I am so proud to be a part of HCMUTE.” Before that, on October 5th, 2017, HCMUTE has given the Honorary Doctorates Degree to Mr. Thomas Kruse – President of SHSE school – Federal Republic of Germany and Mr. Jeffrey Scott Goss, Vice-President of the Arizona State University of the USA. After the ceremony, a number of lecturers from HCMUTE – alumni of the Exchange program in India, stayed and cheerfully expressed their gratitude for the recent opportunities to study in India and took pictures with Mrs. Smita Pant.